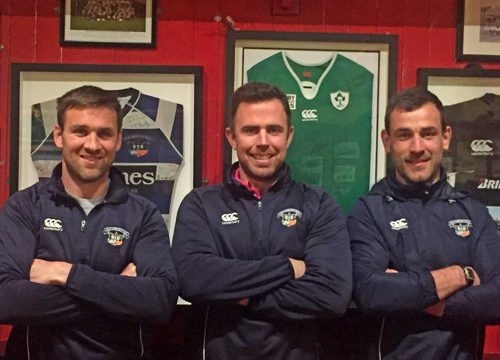 Old Crescent RFC announces new senior coaching management structure for next season! Old Crescent RFC Senior Coaching Management Team, l-r, Eugene McGovern, Director of Rugby, Brendan Guilfoyle, Head Coach, Brian Touhy, Senior Backs Coach. Old Crescent RFC are delighted to announce the club’s new senior coaching management structure for next season. Brendan Guilfoyle will take over from Joe Nix as Head Coach next season. Brendan will of course continue lead by example on the field. Old Crescent sincerely thanks Joe Nix for his hard work and commitment to the club over the last three years as Head Coach with the senior side, and the club is delighted that Joe will continue to be involved with senior rugby in Old Crescent. Eugene McGovern and Brian Touhy will continue in their roles as Director of Rugby and Backs Coach to the senior team. Tommy Pratt will continue as Chairman of Rugby. Having just missed out on promotion through an Ulster Bank League division in one season, Old Crescent senior players and management are determined to go one better next season!